What is the world coming to, when you can't film a motorbike chase in broad daylight, dressed as Captain America, and not have your photo taken? The crew of Captain America: The First Avenger found that out, with pics of today's chase scene popping up online here and here. Pick of the bunch has to be the duo of baddies on decked out bikes, with the HYDRA logo just visible to the left of the front tire. If these are the Red Skulls troops Cap's in for a world of trouble. While the Skull's face is emblazoned on the soldiers shoulders, no pics of the would-be dictator or his star-spangled adversary were taken. 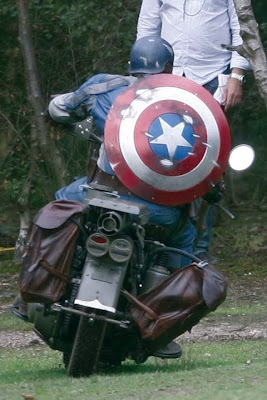 Instead a stuntman filled in for Chris Evans/Cap in the chase, and complete with sheild looked pretty damn convincing, especially from behind. Scope out the full range of shots out for yourself here and here.